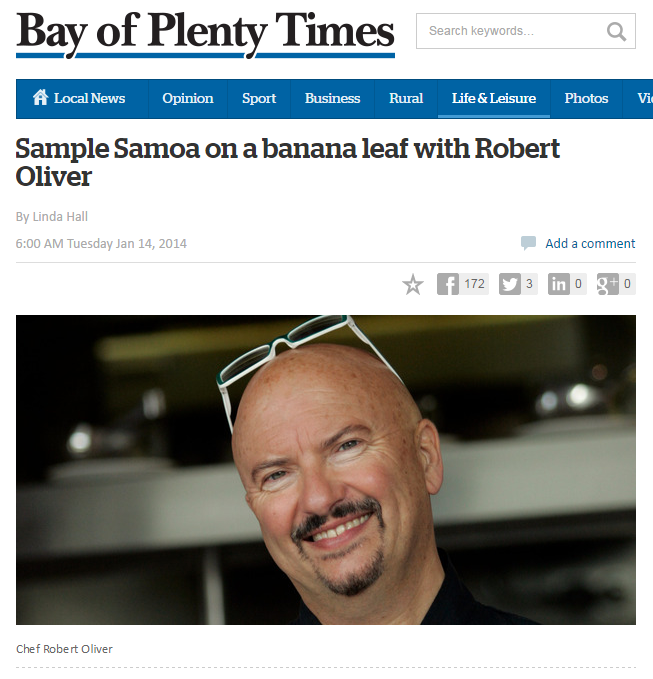 I love the way Robert Oliver combines people, culture and food. He and his team also manage to find the most photogenic, happy people I have come across in a cookbook. Mea’ai Samoa is bright, fun and informative. Each of the recipes tells a story of Samoa and captures the vibrancy of these wonderful people. There are traditional recipes and modern dishes developed by chefs in villages throughout Samoa. Robert Oliver is a New Zealand-born chef who has spent much of his highly successful career working in overseas restaurants. He was raised in Fiji and Samoa, and is committed to sustainable food production and tourism in the South Pacific. His first cookbook Me’a Kai won the Best Cookbook in the World in the 2010 Gourmand Cookbook Awards. No mean feat. I asked Robert some questions. This book was written at the request of the Samoan PM who also happens to be the head of the Pacific Organics Task Force … he really gets the value of raising the real cuisine treasure of Samoa in terms of tourism and health. The fatty meats, etc. have really over-defined Samoan cuisine (I didn’t put any of these in the book; the original diet and the amazing organics – there are 700 organic farms – are the clear way forward for Samoa in terms of all of the above). It was great to focus on one country. After all, Me’a Kai really only touched on each country. It’s a refinement of the vision behind Me’a Kai – a kind of an “inspirational” cuisine book. Most certainly, Samoa has embraced it. HOW DID YOU MANAGE TO FIND SO MANY BEAUTIFUL PEOPLE TO PHOTOGRAPH? So easy in Samoa! Have you been there? They’re truly beautiful people. And because my family lived there for so long, I have many friends there. Also remember, Pacific people come together over food and show love and respect and share with food, and you really get this feeling when you see them literally doing this in the pages of the book. It’s like a Samoan family photo album … the “Desperate Housewives” section are all really good friends. Everyone understood how important this book is for Samoa as a nation. It’s been great as a process and this – “the story of the food is the story of the people” genre – is what I love about food. WHAT IS IT ABOUT SAMOA THAT MAKES IT SO SPECIAL TO YOU? It’s like a second home – when I first came back here to research Me’a Kai and found this amazing organics movement, it’s from the heart of Samoan thinking. A friend of mine, who is a very well-known GMO activist, said to me (referring to the “organic revolution”) how is it that a group of women in this little nation in the middle of the South Pacific is managing to do what larger more powerful nations – indeed, world governments – cannot? I pointed out to her that organics are a natural fit as they reflect traditional Polynesian farming methods, and that the will and the spirit of the nation is behind this with a PM who heads the Pacific Organics Task Force – that’s how. Very cool! So this is what makes Samoa special. 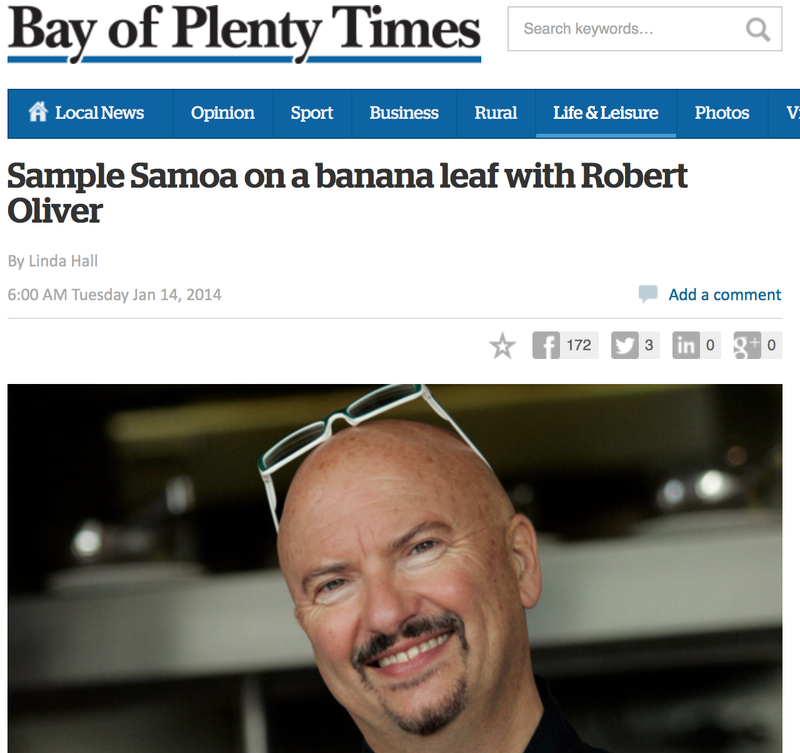 There are also awesome chefs there: Dora Rossi, Joe Lam and Horace Evans stand out … lots of reasons to love Samoa. WHAT IS UNIQUE ABOUT ITS CUISINE? Organic virgin coconut oil, o’o (the sprouting heart of the young coconut), koko Samoa (cocoa), vanilla, all manner of organics … the ingredients here are profound … it’s a massive organic farmers’ market! And as all the fatty meats have had such bad health effects here, there is a real renaissance and recognition of the super-high value of the “original” cuisine here and the chefs are on to it! WHAT IS YOUR FAVOURITE THING TO EAT IN SAMOA? I love koko Samoa – hot, brewed local cocoa – the national drink. I love going to the fish market on Sunday morning and having supo esi (pawpaw rice soup with cocoa), koko alaisa ( a slurpy chocolate-y rice pudding), oka (coconut fish salad) … there are a lot of favourites! IF I WAS PLANNING A TRIP TO SAMOA WHAT WOULD YOU ADVISE ME TO DO? Buy this book and use it as a dining guide! Go and ask for the chefs you see in the “Chefs and Restaurants” section and tell them I sent you! To eat? Go to Lupes on Sunday at noon for “toa’nai” (umu and more) and then flop into the water with a niu (green coconut). TELL US WHAT ELSE YOU HAVE BEEN UP TO SINCE YOUR LAST BOOK? Real Pasifik (view at TVNZ Ondemand). The whole series has been amazing … and we’re shooting season two soon! IF YOU COULD TAKE ANYONE IN THE WORLD OUT FOR DINNER WHO WOULD IT BE? A long list comes to mind. I was really thrilled to have dinner with Dieter Paulmann in Auckland … he’s the man behind the Pacific Voyagers [Foundation ]… he is a serious visionary. We did some of the shooting for Real Pasifik on its vakas – I think we are doing with food what they are doing with sail: rediscovering the brilliance of the Polynesians. It’s quite “decolonising” in effect. Yeah, Dieter is an amazing man.